New figures from Public Health England (PHE) reveal England’s poorest areas are fast food hotspots, with 5 times more outlets found in these communities than in the most affluent. The data also suggests fast food outlets – including chip shops, burger bars and pizza places –account for more than a quarter (26%) of all eateries in England. The local environment has a major influence on our behaviours and streets crowded with fast food outlets can influence our food choices – many of these currently have no or little nutrition information in-store. Children exposed to these outlets, whether out with friends or on their way home from school, may find it more difficult to choose healthier options. The new figures also show a variation in the number of fast food outlets across England, ranging from zero in some wards to over 100 in others. Many local authorities across England have taken action to address their food environment and PHE is encouraging them to learn from each other. At least 40 areas have developed policies to restrict the growth of new takeaways and fast food outlets, and PHE has helped develop stronger planning guidance to support other areas in doing this. Some have developed ‘healthier zones’ to help tackle childhood obesity by limiting the number of outlets in areas with high concentrations of fast food outlets, high levels of deprivation, or where children gather – including near schools, community centres, parks, playgrounds and other open spaces. 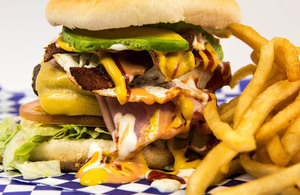 While not all fast food is unhealthy, it is typically higher in salt, calories and saturated fat, all of which can cause serious health problems when consumed too often and in large quantities. Children with excess weight are consuming up to 500 extra calories per day, so creating healthier environments could play an important role in tackling obesity and health inequalities. Over a third of children in England are overweight or obese by the time they leave primary school – this figure is even higher in some deprived communities. This increases their risk of being overweight or obese adults and suffering preventable diseases including type 2 diabetes, heart disease and some cancers. "It’s not surprising some children find it difficult to resist the lure of fast food outlets when many neighbourhoods are saturated with them. Food outlets can make a contribution to our high streets. However, with the impact of obesity on local authority social care budgets estimated at £352 million per year, encouraging healthier choices can make a positive difference. As part of its work to improve the local food environment, PHE supports local authorities’ work with small businesses to provide healthier options. This can be through using less salt, sugar and saturated fat in their products, as well as offering customers smaller portions and promoting healthier alternatives. Some areas have healthy catering schemes to recognise and support local retailers who are making such changes. The Department of Health and Social Care recently announced the second chapter of its childhood obesity plan, including a trailblazer programme to help local authorities learn from each other. Another significant measure is a consultation on mandatory calorie labelling in the out of home sector, to help people make informed choices when eating out. These bold steps were announced as part of government’s ambition of halving childhood obesity by 2030. PHE plays a significant role in achieving this ambition. It has challenged major players in the food industry to remove 20% of calories from popular foods – including chips, burgers, and pizzas – by 2024. This is in addition to its challenge to industry to reduce sugar in everyday products by 20% by 2020. With a quarter of our calories coming from food consumed outside the home, restaurants including fast food outlets and takeaways are expected to play their part. As part of its One You campaign, PHE has also helped consumers find healthier options by partnering with major high street retailers, where millions of people buy their food every day.